Did I ever tell you guys about how much I love red nails? 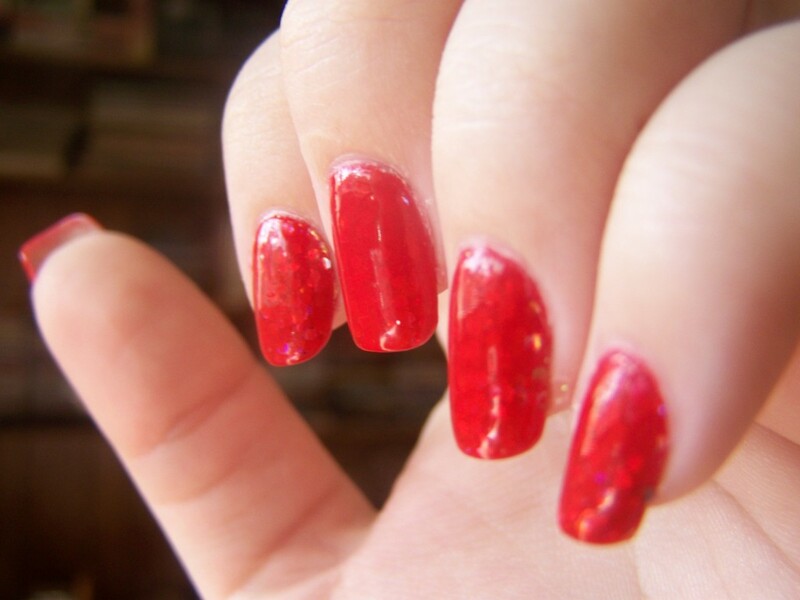 I love red nails. I love glitter. I love the way this turned out. My last attempt at a glitter sandwich was in March, and if you’re longtime reader, you’ll remember this nail fail that resembles Italian food. 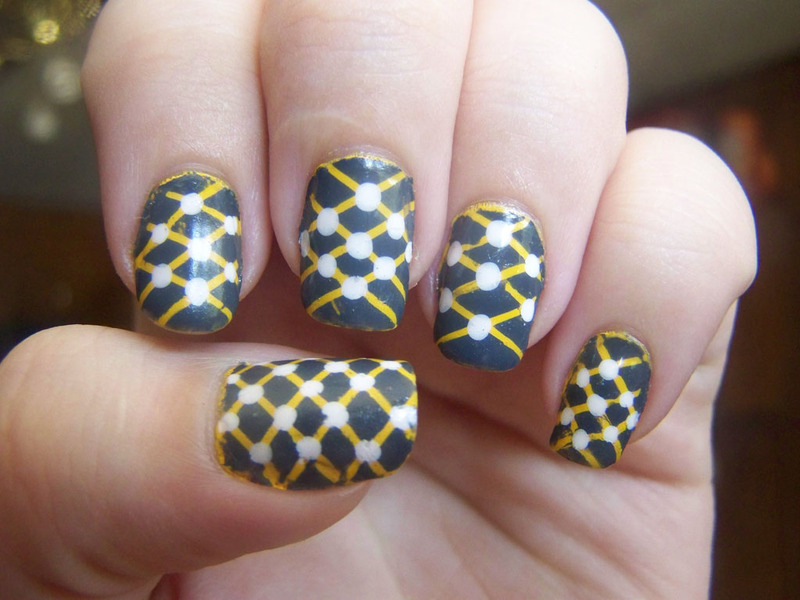 When I did that manicure, this was the one I wanted. Pretty much as soon as I discovered Wet ‘n Wild’s Everybody Loves Redmond was slightly translucent on the first coat, I knew I was going to have to do this. Of course, the coverage seems to build, so had I used a bit more, the glitter would have been totally covered. You can see this on the middle finger, somewhat; I’d uncovered some of the glitter during cleanup, and did a second coat on just that nail. As a result, the glitter is harder to see. In direct sunlight, but still indoors. Unfortunately, these labels don’t stand up to my haphazard storage method of having everything sitting around in a box. 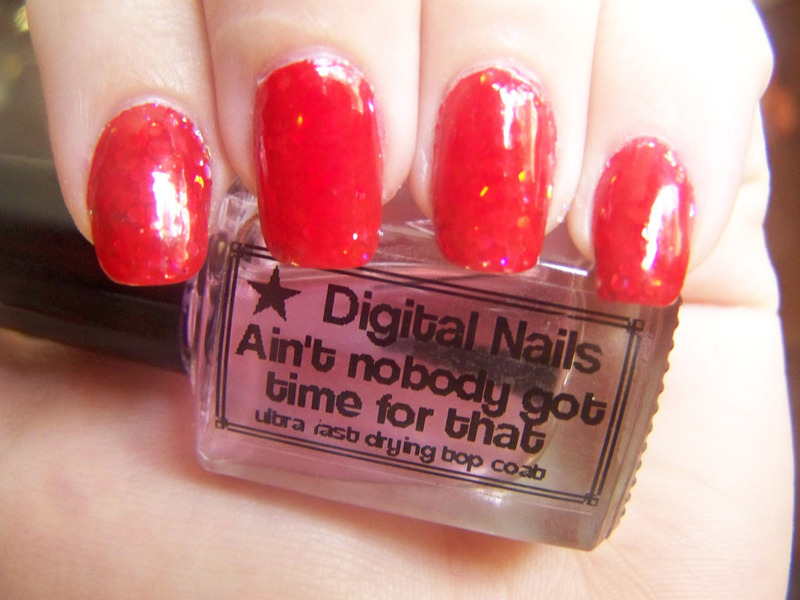 I have a couple bottles of these Wet ‘n Wild Fast Dry polishes, and all of the labels are completely rubbed off. Anyway, I like this color a lot. Indoors, it’s an orangey red, but outside in the sunlight, it’s very red, very bright. I’ll go ahead and admit I had pretty low expectations for this color, but I’m very impressed. 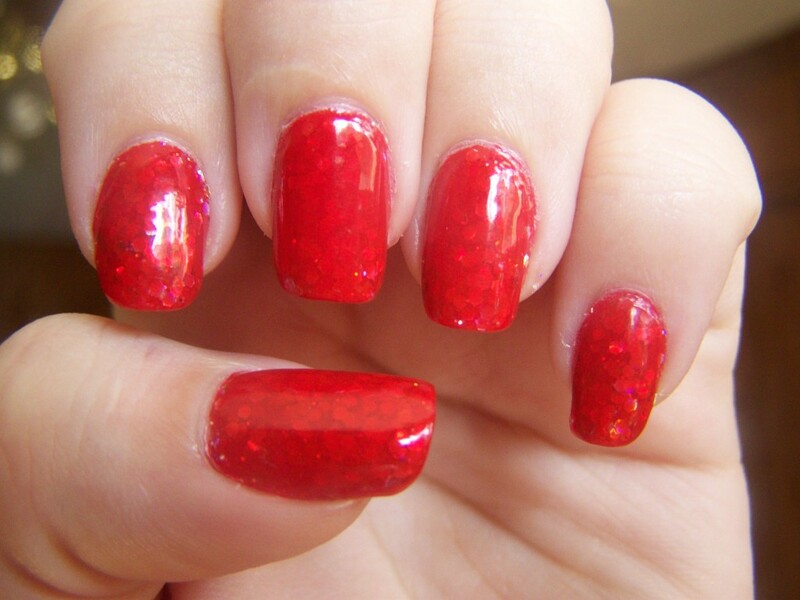 The glitter is Julep’s Paris. I got it in a mystery box sometime over the summer, but it’s exactly the kind of thing I would have chosen and purchased on my own. 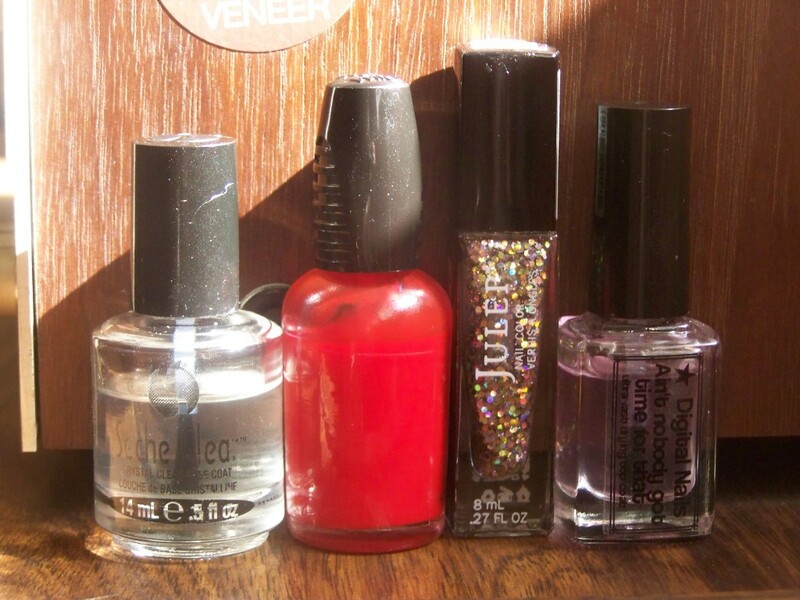 Even though there’s a ton of glitter in the bottle, it’s meant to be used as a top coat, to give a manicure the right amount of sparkle without being over the top. 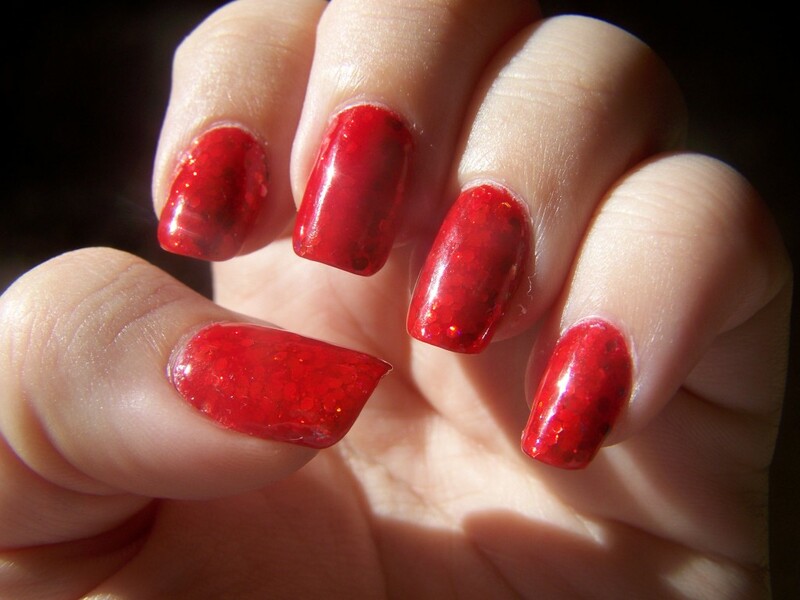 Of course, I don’t like things that aren’t over the top, so I went crazy with this glitter, adding three thick coats before putting down the last layer of red. As a result, the bottle is two-thirds empty now. 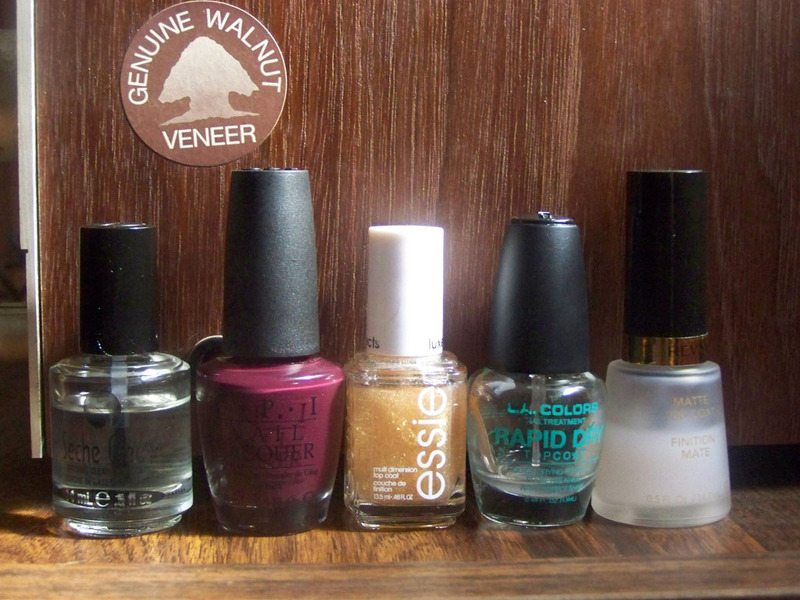 Also, let me tell you some about the topcoat I used this week. I’ve been buying a lot of indie products lately. Indie polish is the latest scourge on my wallet. It’s so gloriously inventive and completely unlike anything I could ever find in a store that the extra money and shipping fees are totally worth it. After the topcoat issues I had the past couple weeks, I decided to try Digital Nails’ topcoat, since I was buying their awesome new color-changing polish anyway. I’m pleased to report that it’s awesome. It dries in about the same time as Seche Vite. I’m really impressed with it. 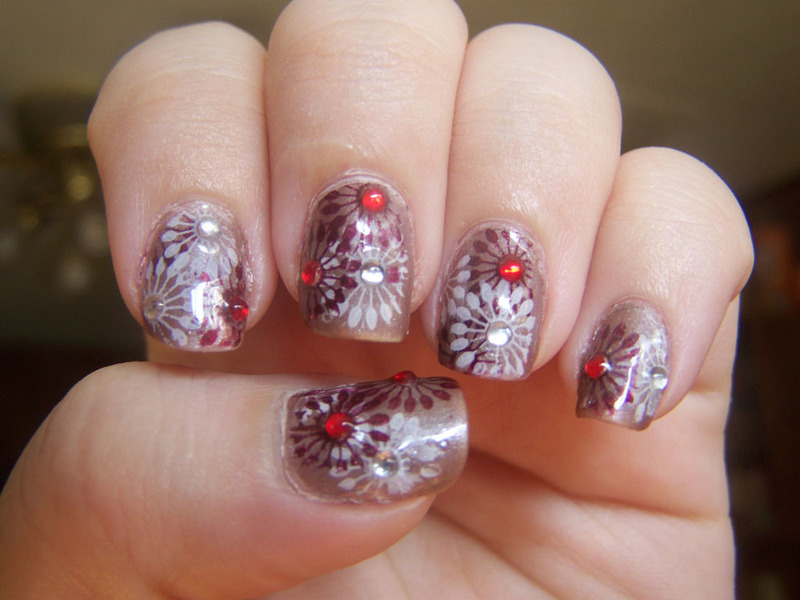 Not that Digital Nails makes bad stuff, but I didn’t expect it to work so well. I’m wearing three coats here, and it gives me great shine and makes my nails rigid, which is something I look for in a topcoat. My nails are extremely soft and thin, and I rely on a hard topcoat to not only protect my color, but my whole nail. I would totally recommend it. Oh Lord Jesus it’s a fire. The only problem is, it was clear when I started. I don’t know if this is an issue with the topcoat itself or the fact that I used it on cheap red nail polish, but now it’s an odd pink. It doesn’t look like the tint affects it in any way, which is good, but I don’t want this to happen every time I use it and having some weird brown topcoat after a few weeks. I guess we’ll see. Here is another great manicure ruined by cheap top coat. It started so well. 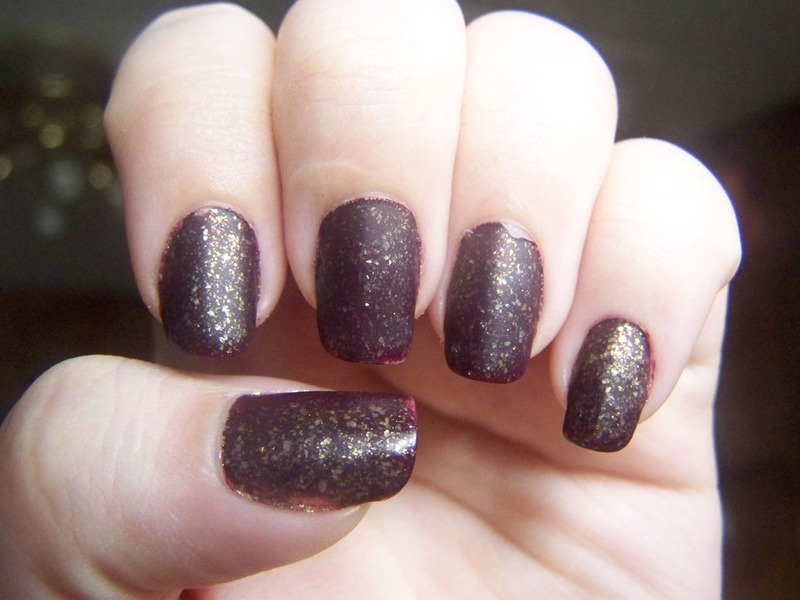 I used two coats of this very dark, very opaque OPI shade called We’ll Always Have Paris. It looked purplish in the fluorescent supermarket lights, and when I got home with it, it was like a deep brown. It still looks purple in direct sunlight, but it’s brown enough that it worked for my purpose this week. I’m still not entirely sure what color it even is, and I’ll admit it I just bought it for it’s name, because I’m kind of obsessed with France. I love these dark, vampy colors, though. They remind me of middle school, when I wasn’t allowed to wear black nail polish (or black lipstick, or dye my hair black), but I could get away with just about any other dark color. As a result, I wore lots of of dark purples and silvers and browns to get the same effect. I still love how it makes my nails look. The notch on the ring finger is from picking at dried polish around the cuticle. Entirely my fault. 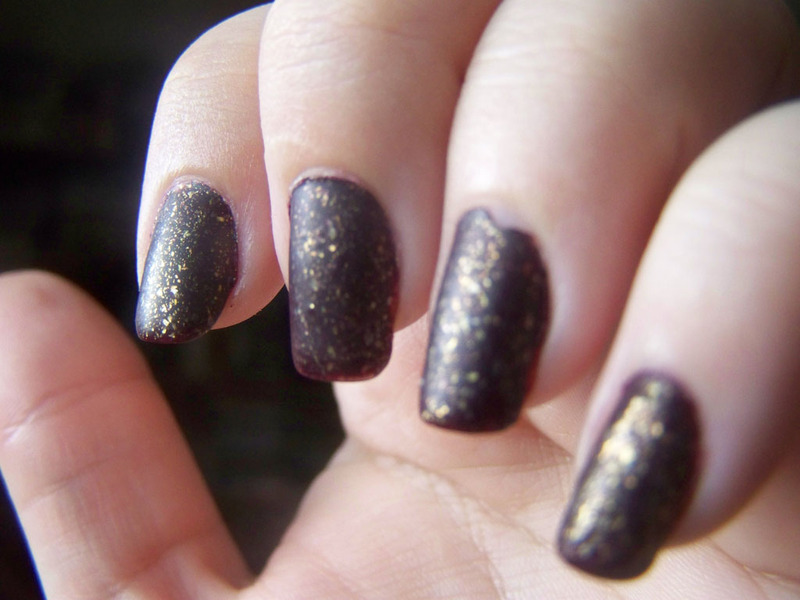 The gold sparkles are As Gold as It Gets by Essie. This is one of the first Essies I ever bought myself, way back around Christmas when I’d gotten some money, and I had to walk the whole mile to Walgreens to get a bottle of acetone because the nearer store was out. While I was there, I checked out the nail polish. I’d come all that way, right? I didn’t yet own any Essie polishes, I had money rolling around in my pocket, I splurged and bought as many as I could carry. I spent literally every cent I had on Essie polishes and acetone. Anyway, I love the Essie LuxEffects line, and I like this one in particular. It gives any color an iridescent warmth and a unique finish, one that’s different from gold leaf or glitter. Adding the matte top coat to it guarantees you can see every piece of gold. Somehow, I don’t know how this happened, the top coat completely smudged my tips. Somehow, it ate through three layers of polish, even though I’d given it ample time to dry so as to avoid this. I am so mad at myself for using up all my Seche Vite. I think I’m going to just buy one of those mega large bottles and be done with it.